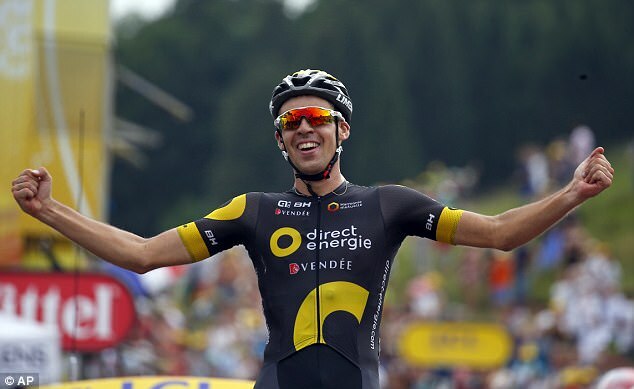 Lilian Calmejane won Stage 8 of the Tour de France in a thrilling late move to win his first stage of the race, despite being chased by Robert Gesink and the rapidly advancing peloton. Calmejane is a big future prospect for France and has already performed well in a Grand Tour, winning a stage of the Vuelta a Espana in 2016 and coming 70th overall. The parcours of the stage were such that the day suited a breakaway but with a fast start there was no rider able to get away from the group, causing a punishing pace as teams attacked and were brought back for the first few km until the intermediate sprint at Montrond. Despite QuickStep setting up the sprint for Kittel is was Lotto-Soudal’s Andre Greipel who took full points on the line in a rare chance for the sprinters to fight for all the points unavailable. Michael Matthews took second and Kittel third to slightly extend his lead in the green jersey competition. The sprint didn’t calm the peloton down though and it took another 25km of racing before eventually a split formed with a group of around 50 riders in front with Froome and the rest of the GC and jersey holders behind. The group of 50 was able to get away as every team was represented, causing Team Sky to ease off the pace and allow them to go. Out of the 50 riders there was another group of 13 to attack and create a leading group with the remaining riders chasing behind them. The 13 out front were Greg Van Avermaet, Michael Schar (BMC), Jan Bakelants, Mathias Frank (AG2R), Koen De Kort (Trek-Segafredo), Michael Valgren (Astana), Jens Keukeleire (Orica-Scott), Serge Pauwels (Dimension Data), Emanuel Buchmann (Bora-Hansgrohe), Thomas De Gendt (Lotto Soudal), Laurens ten Dam (Sunweb), Calmejane (Direct Energie), and Alberto Bettiol (Cannondale-Drapac). With the Col de la Joux (Cat 3) approaching the leaders had an advantage of around 1′ on the chasing group, with Froome and the main peloton another 3’30” back. behind the peloton was a grupetto which included green jersey hopeful Arnaud Demare and it was looking like he would have to work hard to come in under the time gaps. Matteo Trentin (QuickStep), Warren Barguil (Sunweb) and Marcus Berghardt (Bora-Hansgrohe) attacked the chasing group and made it over the the leading group just before the climb and once the climb began, Barguil attacked taking Pauwels with him. The pair contined on on the descent but the with almost 25km of descending to do before the Cote de Viry (Cat 2) the leaders and the chasing group all came back together, despite several attempts to form new groups and catch old ones. The action on the descent had seen the leading group’s advantage over the peloton go out to 2’20” and as they began the climb Van Avermaet, Pauwels, Barguil and Bakelants attacked and got away, with Gesink, Calmejane and Talansky giving chase after them. Gesink was able to get up to the leaders but it was Barguil once again who took the points at the top of the climb with the peloton’s gap staying around the same as the start of the climb. Another descent before the Cote de la Combe de Laisia-Les Molunes (Cat 1) saw Nicholas Roche, Calmejane and Simon Clarke move up to the lead group from the chasers with Astana’s Valgren following a few kms later. On the climb the weaker climbers soon dropped back from the elad group leaving Barguil, Roche, Pauwels, Gesink and Calmejane at the front of the race with 1’16” on the peloton. Barguil’s exertions soon caught up with him and he dropped back as, with 18km to go, Calmejane attacked the group. Roche was the only one able to initially give chase with Gesink following but Calmejane’s attack was too strong and he took full points at the top of the climb with Gesink following 13″ later. The Frenchman began his TT to the finish with Gesink in hot pursuit and it looked like it would be Gesink’s day at one point as Calmejane had to come to a near-standstill with cramp in his legs. He was able to shake it off though and hold off Gesink by 30″ on the line with all of the GC riders coming over the line together in anticipation of a big day in the mountains tomorrow. 4 Nicholas Roche (BMC – Ire) s.t. 5 Roman Kreuziger (Orica-Scott – Cze) s.t. 6 Fabio Aru (Astana – Ita) s.t. 7 Michael Valgren (Astana – Den) s.t. 8 Rafal Majka (Bora-Hansgrohe – Pol) s.t. 9 Nathan Brown (Cannondale – Drapac – USA) s.t. 10 Romain Hardy (Fortuneo-Oscaro – Fra) s.t.